In recent weeks and even months I have not been my usual cheerful self. After returning from sharing companionship and spiritual vision with a group of wonderful women on the Goddess Pilgrimage to Crete, I have been feeling lonely. This feeling came to a head on December 7 when it was cold and grey here in Lesbos, as had it been for weeks. Feeling particularly sad that morning, I realized that December 7 was my mother’s Yahrzeit, the twenty-third anniversary of her death. The fact that I must use a Yiddish word to speak of this important day reflects the fact that we do not have a word (let alone a ritual) in the English language, in our versions of the Christian tradition, or in Goddess feminism to recognize the day a loved one died. As we Americans all know, we are supposed to get on with it and not dwell on death and dying. That afternoon, I girded my loins and knocked on a neighbor’s door to ask for help. 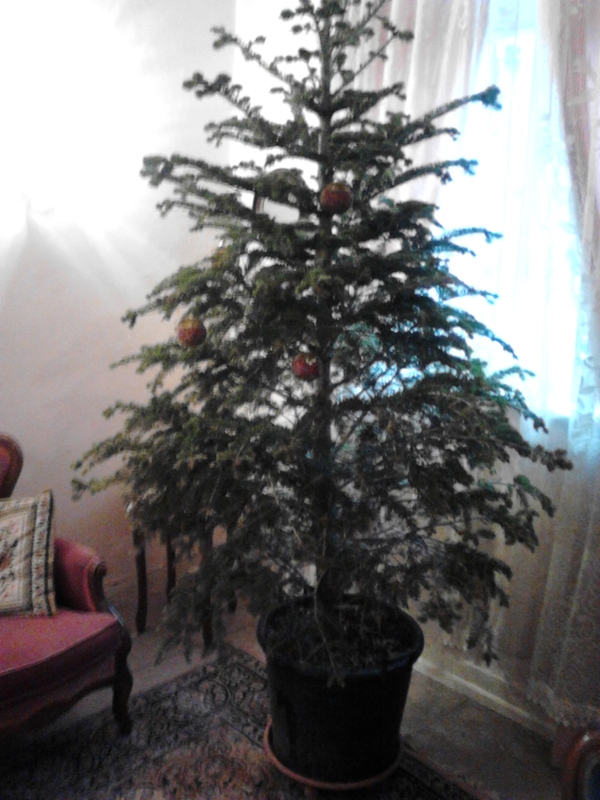 Of course one of the reasons that I was feeling sad is that as I live alone, I have no one to help me move a heavy tree. The neighbor’s shy son was more than willing to help, and we were lucky that we got the tree in a day before the pounding rains that would have doubled the weight of the soil in its pot. 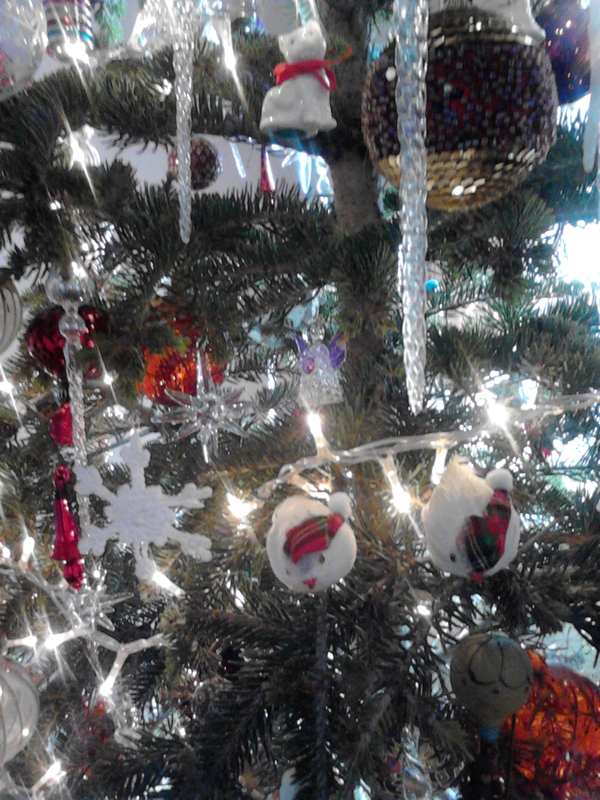 As I decorated my tree over the next two days, memories of my mother flooded into my mind. How I miss my mommy. “Do you still think of your mother?” I asked an older friend shortly after my mother died. 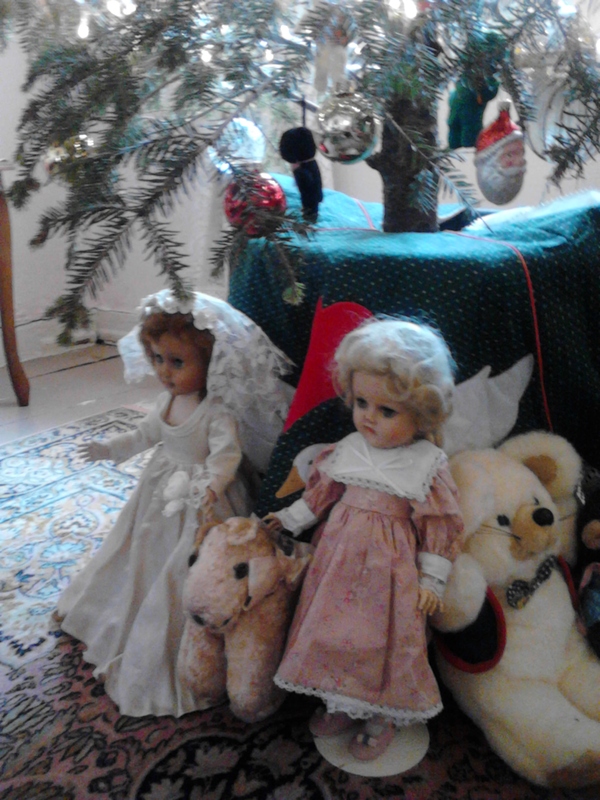 “Yes,” she replied, “Every day.” Me too, I thought, as I unwrapped the Christmas tree skirt, one of the last gifts Mom had given to me, and the dolls and pink doggie she had saved for me. The ritual of decorating my tree for Christmas is my memorial to my mother’s love. How much fun we had choosing what was usually a scrawny tree—the largest we could afford, but not the smaller prettier one my mother would have preferred. How I remember baking and decorating cookie cutter cookies—eating the raw dough, licking the sugar icing from our fingers, and always putting what Mom said were too many red hots and silver dots onto the cookies. My mother’s memories of Christmas were not all happy. But my Mom tried her best not to dwell on sadness. Shortly before she died, I found my mother baking cookies for a man who also had cancer. “I was feeling sorry for myself,” she said, “so I decided to do something for someone else.” I could hear my mother’s mother speaking through her in that moment. My grandmother’s attitude, which was Midwestern, Christian, and deeply female, was nearly lost to me, for I come from the generation that discovered therapy. In the process of dealing with our feelings, we criticized our ancestors for not doing the same. As Christmas approaches this year, I wonder: were my Mom and my Grammy right? Is there a profound truth in their knowledge, transmitted through the generations, that the best way to deal with one’s own sorrows is to do something for others? If so, then I guess it is time to plan my winter solstice birthday party (which I was also thinking of cancelling this year)–pick up the phone and start inviting friends over to enjoy my home, my tree, and my food, the gift of life shared with others. Happy Winter Solstice to all and to all a good night! all the mother love that she might have given you had the patriarchy not nipped womanlove in your life. afraid of mother connection because my biological mother was so wounded and impaired by our culture. Will go to Sobonfu’s Grief Ritual at Breitenbush hot springs in Oregon this coming February and keep cleaning up that connection. Women are so wonderful and our mothers loved us more than we can know and more than was safe for them to express. Now that they are in spirit that mother love can pour through to us if we (or I) am able to receive it. May you also receive mother love- all you can soak up. Best wishes for a holy holiday. Dear Ellen, I did receive a special communication and apology from my mother in a dream not long after she died. Whether that was her speaking to me or me carrying on her spirit in my life, I do not know, but it was very healing. Yes it is sad that for some women their connection to their female line is so wounded; I am lucky that my mother and both of my grandmothers were able to express great love for me, despite their own connections to patriarchy. Love to you too. little by little the moon appears. beautiful! and yes just right. Thank you for sharing your vulnerable side with the rest of us vulnerable women who also miss our mothers…and, in my case, my older sister, too, who died of lung cancer in the Spring. Like your mother, “Mama” was a baker, and a giver, to the end: the night she died (just after I had traveled, non-stop, from Saudi Arabia to the West Coast, and made it just in time) she got up and told the hospital staff she had to go home. “My girls [me, my sister, and my niece] are here. I have to bake!” she said. Those were her last words…but appropriate ones. Like your mother, she dealt with her feelings by doing. Your message of remembrance and light, and of your own effort, are much appreciated. And there must be many others out here besides me who, unbeknownst to you, are touched and encouraged by your words. What a lovely matriarchal heritage: “I was feeling sorry for myself,” she said, “so I decided to do something for someone else.” I could hear my mother’s mother speaking through her in that moment. I will remember these words as we continue into the darkness and then, in a week, the return of the light. Thank you for sharing so much with the readers of FAR: your thoughts, memories of your mother, and beautiful Christmas tree. We are not so separated and far away as it may feel to you sometimes. It is through our efforts that we remember our connections. Carol, I’m glad you and others have fond, loving memories of your mothers. Both my mother and my step-mother were cold, unemotional, extremely unhappy women, so I have few of those memories. For us pagans who like trees and Yule decorations but don’t need the creche underneath and the angel on top. my friend Ed Fitch, who is a Gardnerian high priest and definitely not a feminist, suggests in his book The Rites of Odin that “it is often rewarding to decorate the Yule tree so that it reflects Yggdrasill, the mythic World Tree.” We can trim the tree “as normal,” but add a bright star (the North Star) and an eagle, for Odin, giver of victory and wisdom, at the top. In the upper branches of the tree, he says, place Valkyries and swan maidens and lots of stars and lights. At the base of the tree should be a cave with the earth dragon, images of the Three Norns, a pool (use a mirror), and a cauldron. Reindeer can stand in the snow around the base of the tree and squirrels can sit in the branches. A manger is also appropriate for Mother Frigga and her newborn son, “the promise of the new year.” A pair of wolves can guard them, and the “three male wanderers” can be Odin, Thor, and Loki bringing gifts to Frigga’s Sacred Child. Sorry about your female line, Barbara, that is why we need to change the world. Good Yule, dear Carol, and Happy Birthday. I like to observe both death days and birth days. Thank you for sharing the word Yahrzeit. My grandmother also recommended Doing Something for Someone Else as a cure-all. Her admonition included shaming me for “wool-gathering.” If we can remove the shame (why not?) doing something thoughtful and kind for another is just good–and sweet–advice. Thanks for the reminder. I loved your blog this morning, Carol dear. I don’t know anyone else who celebrates Yahrzeits, even in my family. Yes, it is a Jewish custom, I don’t know others who observe it — my parents didn’t. But regularly, Greg and I light Yahrzeit candles for family members and dear friends who have passed on. Not only does it honor them, but for me it is very comforting. I make a little altar with a photo of them and sometimes a few pretty things. I also agree so heartily with your mother and grandmother: the only way I can come out of sadness — particularly when I lose a loved one — is to make someone else happy. Thanks so much for introducing me to the word Yahrzeit and now the custom, Miriam. I understand there are special 24 hour candles in glass, where do you get them? Love. I get Yahrzeit candles at the Jewish bakery. There’s also a practice of saying Kaddish, the prayer for the dead (. . . “may the One who makes peace in the high places make peace for us. . . “). Some people follow this only for their parents while others will light a candle/say a prayer for friends as well. A further comment on Yahrzeit candles. The ones I’ve seen are made from petroleum products. Unless it’s important to you to use an official one that burns for exactly 24 hours, it would be ecologically sounder just to use a long-burning beeswax candle infused with your intent. I loved your blog, too, Carol. For the first year my daughter is not coming back to Wisconsin for Yule. My spouse thinks that means we don’t need a Solstice tree, but then it will be even bleaker here. So…sometime this week I’ll be trimming a tree, too. Rituals like thos –and like Miriam’s Yahrzeit candles and altars — brighten up our lives and remind us of what is important. Trees aren’t only for children, are they? Mine is giving me great joy even though till now only one person has been inside to see it. However, as soon as I had it up, a neighbor who had passed by and saw it in the window commented on it. I have a fantastic spouse. He went right out today and bought a tree. Tomorrow will be sunny for the first time in days (it’s been soooooo gray), so I’ll bring my mother to my house and together we’ll trim it. What a beautiful post and a beautiful tree – thank you for sharing photos of it. I strongly believe that walking through our sorrow by doing compassionate acts for others is strongly feminist – engaging our deep connections to others to create a world that is more caring, more just, less cruel and violent for everyone. When we heal others, we heal ourselves. I know it is my cure-all when I’m feeling blue. My sister and I remember the anniversaries of our parents’ deaths to each other, which is painful, but also a reminder to us of the amazing way they both lived and the legacy of values they gave to us. I will always remember being with my mother as she died and having the absolute conviction as we sat together that love is eternal and that the relationship between us would continue, even when one or both of us are no longer in our physical bodies. I frequently feel her with me. 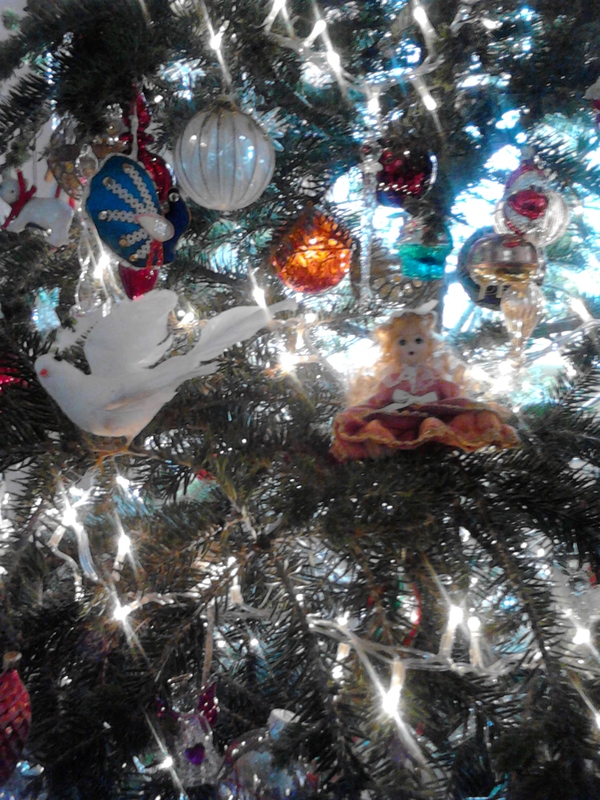 Your tree is a magnificent way to honor your mother and your memories of her. Yes I felt the eternal love that surrounds us always as my mother died too. I often find holiday time very sad, filled with a great sense of loss. Loss of a parent, loss of friends, through death or even dearest women who have moved cross country. I hate this kind of loneliness, just hate it. And what really works for me is to be with other friends, to invite someone over for a glass of wine, to call people. That really helps, but somehow the pain of December gets embedded into songs, or the spirits of the dead coming to visit, and it is unnerving when this happens. Sometimes, it helps for me to even be with total strangers, I find people comforting until the memories die down a bit, and I can enjoy the season and a new song or two. I hope we can help make the loneliness go away Carol for just a bit! Thanks to all of you for your heartfelt responses. Funny you never know when what you write will touch such a chord. Turtle Woman, I’d share a glass of wine with you if I were nearer. My solstice birthday plans are underway. And we are deep in winter weather here in Lesbos, unusual for us, especially with global climate change. I love the the cold weather and the am enjoying the darkness. Mom and Gram are with me, a dear friend will be coming to visit, and other friends will join us on solstice eve around my tree. All of you will be there in spirit. Happy Solstice to all. Rereading all of your notes brought a sweet tear to my eye. May we all find ways to increase joy and lessen sorrow in this season of darkness and light. Your beautiful post and the responses of others brought tears to my eyes. I am so blessed to have a wonderful mother who discovered therapy and the women’s movement when I was in high school. Last year I brought my mother to live with me and being together has been so wonderful for us both. My husband died 7 years ago and I thought I was coping well with his death, but his death left me with a great wound and having my mother here is healing that wound. By the way, your tree is beautiful, Carol! May you have a fabulous solstice, birthday, and Christmas! Carol, your post aroused so many memories. As I mature, I realize how much love my mother put into making Christmas special for my brother and myself. Being alone at Christmas has not been uncomfortable for me. But as the years pass, I am inclined to do something to help others find joy and so this year, a group of us in the apartment building are having a potluck, with an “open door policy” for anyone who is alone and doesn’t want to be. Expecting lots of fun!